In India, Nepal, and other South Asian countries, a tree called sapindus mukorrosi grows small fruits surrounded by a firm outer shell. This tree is unique because it produces its own natural saponins, a soap-like product, that coats the shell of the fruit. When the fruits ripen and fall from the tree, local families harvest it, then remove the fruit from the seed. The soap nut shell is then dried out in the sun, using absolutely no chemical processing or manufacturing processes. The soap nut shell absorbs water and releases saponins which circulate as a natural surfactant in the wash water, reducing the surface tension of the water and freeing dirt, grime and oils from the clothing. They act just as commercial laundry detergents, but without the chemicals. When the clothes are rinsed, the soapnut saponins are washed downstream where they remain harmless to the environment. No synthetic chemicals, no fragrance chemicals, no foaming agents or other toxins. Just shells grown by nature. Soap nuts are an excellent choice for people who desire to use environmentally friendly products. They are a pure product, and contain no added chemicals, fragrances, dyes or fillers. They are also wonderful for people with skin allergies, eczema, or sensitivities to commercial detergents. up of coconut coir fiber bound together by a non-toxic adhesive, and is completely biodegradeable and eco friendly (will not scratch dishes or utensils). I had heard alot about Soap Nuts, and there natural cleaning ability, however I have to admit; I was skeptical. When I received the package of Soap Nuts and Coconut Coir Fiber Scrub pads for review, I was excited to find out if natural cleaning was a possible transition that we could make in our household ( I am always looking for environmentally friendly alternatives to household products and cleaners). 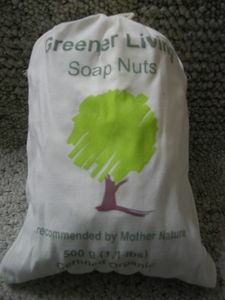 I received a 500 gram bag of Greener Living Soap Nuts, which included three small fabric bags. You place the appropriate quantity of soap nuts(depending on the size of the load) in the bag and then into your washing machine. After using soap nuts for the past few weeks, I am excited to say that not only do they clean (and well), they have been great for my family; as all of us have sensitivities to dyes and fragrances that are frequently found in laundry detergents . This all natural alternative is not only efficient, it's extremely cost effective! A 1.1 pound bag ( which does 150-200 loads of laundry) is only $20! Soap Nuts can also be boiled with water to create dish soap, and household cleaner! 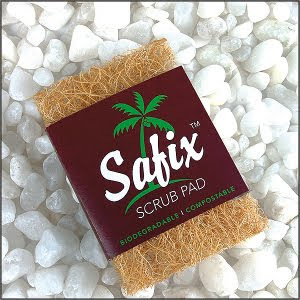 In addition to the soap nuts, I had the opportunity to try the Coconut Coir Fiber Scrub Pads I used one in the kitchen, where it cleaned the dishes well ( without marking or scratching), and the other in the bathroom ( great to scrub the tub, quickly and easily). Not only do these all natural scrub pads clean well, they retain odor, and dry out quickly. Mine are still intact and ready for additional uses after a couple weeks of use! I am excited to have made yet another "greener" choice for our household! We love soap nuts, and will continue to use them to clean laundry and around the house. Discover the natural cleaning power of Soap Nuts & Coconut Coir Scrub Pads! One Lucky Reader will receive a 500 gram ( 150-200 Loads ) Bag of Soap Nuts + a 2 Pack of Coconut Coir Scrub Pads! Leave a comment~ Which Greener Living item's would you love to have? Your comment is considered your entry.